That’s for the U.S. alone, and maybe that does seem that huge, but apparently that’s one DS sold every five seconds. I love my DS, so I can totally understand the appeal. I would think the biggest selling point for the system are the games, the DS has so many titles that appeal to a broad audience. “There’s no letup in sight,” says George Harrison, Nintendo of America’s senior vice president of marketing and corporate communications. REDMOND, Wash., Dec. 11 /PRNewswire/ — While many eyes are focused on home video game consoles, Nintendo projects Nintendo DS(TM) to be the top-selling system of the year. More than 6 million Nintendo DS portable video game systems have sold in the United States in 2007 through Nov. 30, according to internal Nintendo of America Inc. sales numbers. That’s a rate of about one sold every five seconds of 2007, enough to project Nintendo DS will be the top-selling video game system of any kind for the year. Nintendo DS has increased its sales in the United States every year since it launched in November 2004. Nintendo DS beat that Thanksgiving week record with more than 650,000 sold. DS, Pokemon(R) Diamond and Super Mario(R) 64 DS. Another eight games have sold more than 1 million each in the United States, including Brain Age(TM): Train Your Brain in Minutes a Day, Pokemon(R) Pearl, Animal Crossing(R): Wild World, Big Brain Academy(TM) and four separate versions of Nintendogs(TM). The worldwide innovator in the creation of interactive entertainment, Nintendo Co., Ltd., of Kyoto, Japan, manufactures and markets hardware and software for its Wii(TM), Nintendo DS(TM), Game Boy(R) Advance and Nintendo GameCube(TM) systems. Since 1983, Nintendo has sold nearly 2.5 billion video games and more than 430 million hardware units globally, and has created industry icons like Mario(TM), Donkey Kong(R), Metroid(R), Zelda(TM) and Pokemon(R). A wholly owned subsidiary, Nintendo of America Inc., based in Redmond, Wash., serves as headquarters for Nintendo’s operations in the Western Hemisphere. For more information about Nintendo, visit the company’s Web site at http://www.nintendo.com. Seriously, I think that is the best picture in the history of pictures. 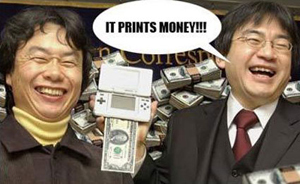 “It Prints Money”, that is brilliant. Look at those two, they are having a blast with money. Who doesn’t like to have a blast with money?